UT’s women’s volleyball team will wear the same jersey come game time, but this season they won’t just be sporting their number, they’ll be representing no.24. Melissa Vanderhall, former UT student and volleyball player from 2006-2011, wore that number throughout her collegiate career and the number will be retired Sept. 23 at her memorial match. On Aug. 12, 29-year-old Melissa was one of three women murdered at her Hempstead, New York, residence, according to the New York Daily News. Thirty-four-year-old Bobby Vanderhall, Melissa’s brother, has been charged in the attack. Fifty-eight-year-old Lynn Vanderhall, Melissa’s mother, and Melissa’s friend Janel Simpson were the other two women pronounced dead at the scene. 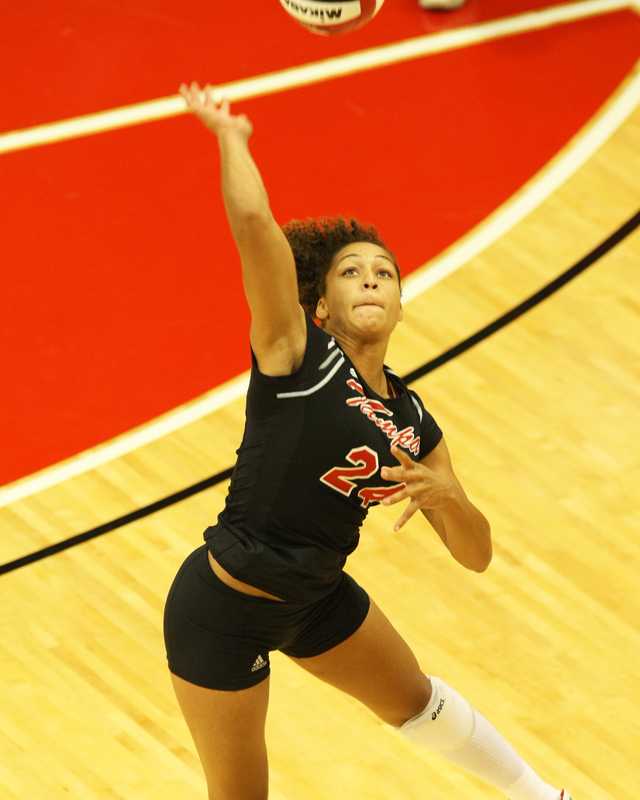 During her time on the volleyball team, Melissa was named a first-team All-American. Not only was Melissa an All-American athlete on the court, she was a great student in the classroom. She earned multiple SSC-Commissioner’s Honor Roll awards during her time at UT. UT volleyball head coach Chris Catanach said when he first met Melissa, he was immediately impressed. Despite being only 5-foot-6, Catanach described her hands “like 6-foot-2 man.” Right off the bat, he knew that she had the potential to be a special player down the road. Her strong perspective in life is one of the main reasons she was able to succeed during her time at UT. Melissa was redshirted as a freshman, which means she only practiced with the team and watched on the sidelines as her fellow teammates went on to win the 2006 National Championship. Usually, students are recruited because they shined all throughout high school. But, this didn’t discourage Melissa; it only motivated her. Being a good teammate is one thing, but establishing a strong friendship off the court is a bonus. Melissa was the perfect representation of exactly that, according to coaches and friends. Jeremy Monteiro, Melissa’s cousin, noted her big smile that lightened up any room. She was someone who was friendly with everyone and an independent person who wasn’t afraid to face tough roads ahead, according to Monteiro. When news first broke out to the family of the three deaths, Monteiro recalled receiving a phone call from his mom and driving straight to the house to make sure what he had heard was true. Though a huge loss, Monteiro said that the support received on social media is what’s getting him through. Melissa also enjoyed leading by example. During her third year at Tampa, she was a member of the Big Brothers Big Sisters of America program. The young boy, Michael Baker, looked to Melissa for motivation in school and life. Melissa on multiple occasions took him to her games at UT, pizza with her friends and teammates and helped contribute to his obsession with shoes. Melissa was always known to have a big smile across her face. Whether she was having a bad day, or didn’t do as well during her volleyball match as she hoped for, you were never able to tell. With the start of the volleyball season, Howlett along with her sister Margeaux Sinibaldi, former volleyball player at UT, along with other alumni organized the volleyball match in honor of Melissa and her mom, Lynn. They have also organized a scholarship foundation entitled “Live for 24” and helped with getting patches with the no. 24. Before the season, alumni including Howlett and Sinibaldi made sure the women on the team this season know exactly who they were representing on the court when they visited their practice.